Home / Classic Line / Scrollwork 3 x 6 Inch Tile~ Add a touch of class! Are you looking for a classic look that is unique at the same time? 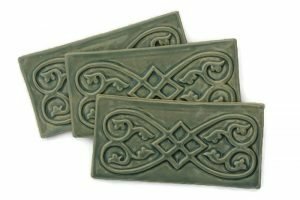 Try this 3in x 6 in Scrollwork Tile! Incorporating this tile in your project as either a border or bits of interest throughout a sea of 3 in x 6 in subway tile, will add a touch of class to your home. We have several glazes to choose from to compliment any décor. You can have a look that is meaningful to you! The Scrollwork tile is a classic design that adds texture when used in tandem with 3 x 6 inch subway tile. This tile can be used together as a border, or place randomly throughout your tile project for interest. Consider this timeless design as a border around your fireplace. The possibilities are endless! We have several glazes in our shop for you to choose from. A variety of colors to match any tile installation and décor. Our tiles are 1/4 inch in thickness to pair easily with natural stone, commercial tile or Fire Creek field tile. We can help you achieve the look of your dreams. Do you still have questions? You can find answers to our most frequently asked questions HERE. Read more about historical designs. We handcraft tile just for you. Please allow 4-6 weeks delivery.